Daily Illuminator: Hop On Board For Worlds Of Adventure! November 19, 2012: Hop On Board For Worlds Of Adventure! If the world's not big enough for your sense of excitement, the latest installment of Pyramid is happy to help. 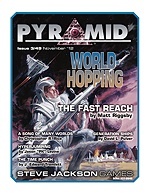 With Pyramid #3/49: World-Hopping, you'll be expanding your travel possibilities in a big way. Are you looking for how to get off world? Then check out the examination of generation ships by Dvid L. Pulver, who also includes GURPS Spaceships goodies to aid in your interplanetary explorations. It also includes new GURPS options for warping across the void -- written by GURPS Assistant Line Editor Jason "PK" Levine -- plus some strange science to visit other worlds from the comfort of your lab. Are you looking for strange worlds or civilizations to visit once you've taken to the void? Then check out Matt Riggsby's collection of planets that are a shortcut to adventure, or the new GURPS Psionic Powers abilities that are perfect to augment and empower more photosynthetic-focused forms of alien life. Plus there are more exciting anomalies awaiting in this issue. Whether you're looking for places to go or ways to get there, Pyramid #3/49: World-Hopping is your ticket off this earthly sphere. Pick it up individually, or subscribe today; the skies await!